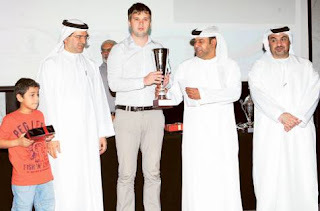 Igor Kurnosov receives his trophy from Saeed Al Maqbali, chairman of the UAE Chess Federation, in the presence of Hussain Abdullah Al Khoury (left) and Ebrahim Al Marzouqi, board member of the club. Abu Dhabi: Russian Grandmaster Igor Kurnosov came from behind to win the Masters Championship title in the 20th Abu Dhabi International Chess Festival. Kurnusov beat Ukrainians GM Zahar Efimenko and GM Mikhailo Oleksienko and Armenian GM Avetik Grigoryan in a tie-breaker after all four finished the nine rounds with 6.5 points. Kurnosov, the top seed, was third after the eighth round but, in his final match, he beat his compatriot GM Aleksandr Rakhmanov as Oleksienko and Efimennko played out a draw and Grigoryan beat Indian GM Suri Vaibhav. Great chess in the region! Congrats to Kurnosov it was tough coming from behind but maintaining focus all through.